Hey there! Thanks for dropping by The Taste of Travel! Take a look around and grab the RSS feed to stay updated. See you around! There are many different ways for you as a tourist to explore a destination. In Siem Reap, Cambodia, you could hop into a motodop, a covered, two-wheel cab that’s hitched to the back of a motorbike. In Saigon, Vietnam, you could climb onto a cyclo, which is characterized by a chair that’s attached to the front of a bicycle. 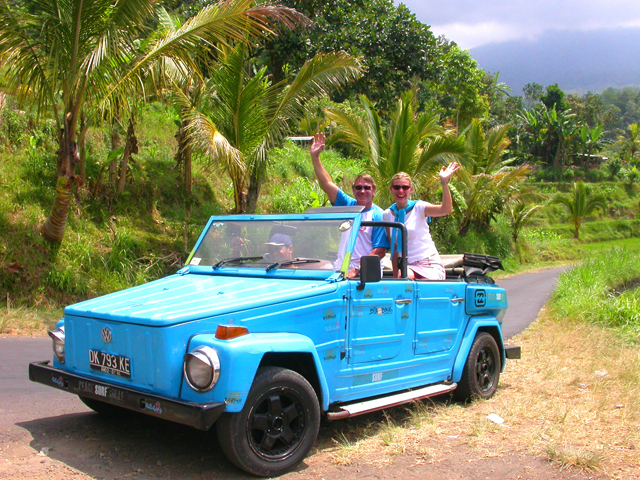 But perhaps nowhere is sightseeing more adventurous than in Bali, where visitors are lured by ‘VW safari’ tours — 4×4 excursions by Volkswagen Kübelwagen, a type of jeep originally built during the second world war as a military vehicle. She is probably most fond of the stretch between Mount Batur and Ubud, for its windy roads that present vistas of mountain streams, small Balinese villages and those terraced rice fields. And you can quickly put the top up in case a tropical shower suddenly hits. Such four-wheel fun is a must-experience during any dream trip to the Island of the Gods. What Regional Festivals Do Asians Love Most? Asian guy with the itchy feet that loves traveling around the world.